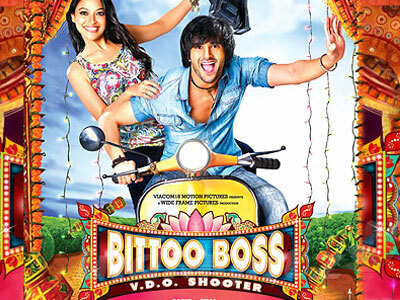 Some masala tracks in the fun frolic voice of Mika Singh and Raghav Sachar, add to that exuberant skill of Sonu Nigam, Shreya Ghoshal and Shahid Maliya with some added spicy effects from Natalie Di Luccio and Master Saleem...that's what the soundtrack of Bittoo Boss is all about (from the makers of last year hit Pyar Ka Punchnama). The most beautiful thing about this OST is that the listeners don’t know what to expect from the music director Raghav Sachar and guest composer Gajendra Verma, who hardly had any recognisable soundtrack in Bollywood till date. With six bindaas originals and two remix versions, let's dwell inside and find out what this Sesky V.D.O Shooter offers with Kumaar on the seat of Lyricist with guest lyricist Luv Ranjan and Aseem Ahmed Abbasi. It's naughty, it’s catchy, it’s mischievous...“Bittoo Sab Ki Lega" is a kind of obvious euphemism which kickstarts the proceedings and surprises everyone. Guest lyricist Luv Ranjan (Director, Story Writer and Lyricist of 'Pyar Ka Punchnama') writes some double meaning phrases which will get mixed reactions from the listeners. At the music launch Salman Khan claimed this song to be a strong contender for “DK Bose”, but honestly “DK Bose” was more clever and creative whereas this composition goes straight in the face. Nevertheless, Mika sets the mood perfectly with good support from Natalie Di Luccio and Neeti Mohan, although a talent like Natalie is not utilized to her full potential. All in all, an introductory composition which may very well be used for the starting credits and as a background score. Good start! Roo Tere Naam Waali, Har Vele Katti Jaavan"
Don't miss this one folks, a perfect chart scorcher with potential to have a long shelf life and a certain place in the playlist of all music lovers! Shahid Maliya replaces Sonu Nigam (not actually) for the reprise version, "Kaun Kenda (Remix Version)" which is more of a solo outing for Shreya Ghoshal where Shahid Maliya does some terrific alaap portions here and there. Shreya Ghoshal is a gifted artist without a sheer doubt; I was in trance on realizing how amazingly beautifully she does the qawwali portion from 3.30 to 3.56. Unmissable! The soundtrack takes a 180 degree turn with "Kick Lag Gayi" which is in the limelight for past one week, courtesy some pretentious energetic dance moves by the lead debutant actor Pulkit Samrat, must say- well choreographed steps. Tulsi Kumar starts with some Punjabi folk renditions and Raghav Sachar energetic singing turns the number into a complete Punjabi dance number with lots of dhols and a blend of desi and Western instruments. Tulsi Kumar's voice is stereotyped for such folk renditions, well done Raghav. Come to the lyrics and Kumaar impresses yet again with Punjabi lyrics. It will get immense popularity with time and moreover once the movie releases. Smash Hit! Undoubtedly it returns back in the voice of hugely talented Master Saleem with no change in the female vocals. "Kick Lag Gayi (Remix Version)" is more or less the same as the original and surprisingly despite Master Saleem being a master of this Punjabi genre, the other version in the voice of Raghav Sachar was more effective and powerful. Anyways, this is a kind of track that is worth repeated hearings, so ENJOYY! Munde Saare Pagla Jaande, Dekh Tenu , Bhangda Paande"
A remix is what one craves for! An attempt with some philosophical thoughts is what "Kabootar" by Mika Singh is all about. A fast paced fun number which will be an interesting watch onscreen. The second interlude (2.46 onwards) has a touch of retro to it with some sublime trumpet/piper sounds alongside electric guitar- Good arrangements indeed! Kumaar disappoints a bit in the only antara, where he had the liberty to induce some more thought-provoking stuff. Here comes THE song of the album or more specifically THE song of 2012 till date (after the superb “Raabta” from Agent Vinod recently)... "Mann Jaage" is enriched with quality, all from the lyrics to the arrangements to the singing. Guest composer Gajendra Verma (the controversial singer behind non-film composition 'Emptiness-Tune Mere Jaana') uses the newly found talent of Shahid Maliya in an aristocratic way and boy! What stuffy, striking work by guest lyricist Aseem Ahmed Abbasi. The beautiful Jugalbandi of sitar/santoor, piano and guitar at the very start (and later in the interludes as well) leaves one in trance- Majestic! Close to six minutes, its absorbing, captivating and top notch. An aggressive promotional strategy is what this elegant work demands. Bittoo Boss comes as a big surprise, not that it offers something monumental or extraordinary but it does provide tunes that are at least worth a single hear. All the songs are high on lyrics, especially 'Kaun Kenda' and 'Mann Jaage'. Raghav Sachar provides some pure Punjabi fun tracks that will help along the narration and will be a key in luring the audience to the Big Screen. Go grab the CD now!